Are you looking for a new garage door opener? Then we have some good news for you. There are many different options to choose from these days, with different brands using different features to make their models stand out. It can be confusing trying to work out which type and model is going to be best for you, so we decided to break down some of the reasons for choosing different types of openers, in order to help you make an informed decision. 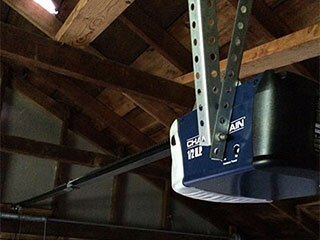 The most common, and often the most affordable, type of garage door opener is the chain drive unit. As the name implies, this device uses a chain attached to the motor gear on one end and to a bar that's attached to the door on the other end. Models of this type are strong and relatively cheap, but the metal chain can make quite a lot of noise while the unit is working, and it will also require some adjustment from time to time. If you want to keep noise to a minimum, this is the type of opener for you. By replacing the metal chain with a steel-reinforced rubber belt, opener models that use this type of drive system operate much more quietly. This is an ideal choice if you have an attached garage and want to keep noise output to a minimum. Be aware that these openers are usually more expensive than chain drives, however, so if budget is extremely tight, you'll need to consider whether or not it'd be worth it to get one. The third type of opener is the screw drive based type, which replaces the metal chain or rubber belt with a long, threaded rod. These types of openers reduce maintenance and repair costs, because they consist of fewer moving parts. This is also the fastest of the three types, however it can be affected by drastic temperature shifts, and it isn't exactly quiet. Smart home technology is becoming more and more common, and your garage is no exception. Many manufacturers have started to incorporate new features into their garage door opener models that make these devices much safer and more convenient to use. Chamberlain’s “MyQ” app allows you to control your garage door with your smartphone from anywhere in the world, as long as you have internet access, of course. This can be very helpful if you need to let someone in while you’re away, or simply want to monitor the condition of your door. You can even integrate it with services like IFTTT; connect it with your phone’s GPS to have the door open when you’re a block from home. Our technicians can help you decide which opener is perfect for your home. Once you know what you want, we'll install your chosen model safely and securely. We work with the industry's leading brands like Chamberlain, LiftMaster and Genie. Contact us today to find out how we can help you.